It was no eight-lateral pass, 91-yard kick return for the win at the last second, but the No. 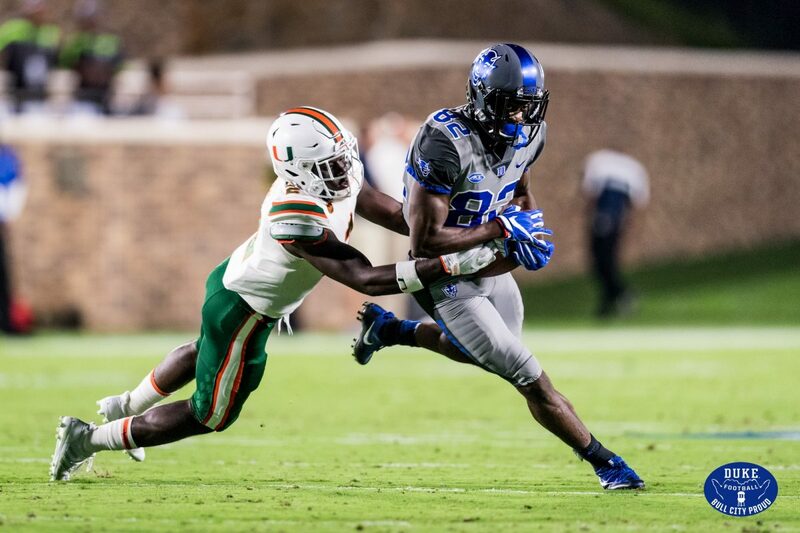 14 Miami Hurricanes dominated on both sides of the ball to hand the Duke Blue Devils their first loss of the season in a 31-6 victory on Friday night at Wallace Wade Stadium. Canes redshirt junior quarterback Malik Rosier returned to the place where he started his first game back in 2015, and once again, delivered a strong performance using his arm and his legs to lead his team in its first ACC matchup of the season. Rosier finished with 270 yards passing with two touchdowns to one interception, and ran 15 times for 45 yards and another score. He started about as hot as a quarterback could, completing his first nine passes, including a pinpoint 27-yard touchdown pass thrown right into the chest of senior receiver Braxton Berrios. On the play, Rosier felt pressure and took a hit, but was still able to hit his throw on target. Miami defensive coordinator Manny Diaz finally got the performance he’s been wanting from his defense. Led by an enthusiastic Michael Pinckney, the Hurricanes showed exactly why they received so much preseason hype. The Hurricanes (3-0, 1-0 ACC) racked up 11 tackles for loss, five sacks and forced two turnovers, while also holding the Blue Devils (4-1, 1-1 ACC) to just 5-19 on third down. Duke’s offense had difficulty finding a consistent rhythm. Blue Devils quarterback Daniel Jones completed just 51 percent of his passes for only 166 yards and an interception. Receiver Johnathan Lloyd had a solid performance, collecting 82 yards on nine catches, but it was not enough to hold off the Canes. Pinckney, a sophomore linebacker, had his best performance of the year by far, totaling 10 tackles, a key sack in the first quarter to stop a potential scoring drive, and an interception. After the pick, Pinckney was quite excited to wear the coveted “Turnover Chain” – so much so that he received a penalty for taking off his helmet on the field as he prepared to receive the gaudy piece of jewelry. Sophomore linebacker Shaq Quarterman had another quality start with nine tackles. Sophomore defensive end Joe Jackson, who had 8.5 sacks in 2016, had a sack, two tackles for loss and a quarterback hit against Duke. Sophomore cornerback Malek Young added three pass breakups as he continues his strong season. All-ACC receiver Ahmmon Richards made a thrilling return to the football field, playing in his first game of the season after missing the first two with a hamstring injury. He didn’t miss a step, catching three balls for 106 yards and a touchdown. It is the fifth time Richards has topped 100 yards receiving in his college career. The highlight of the night for Richards came on a routine slant pass that turned into an electrifying 49-yard touchdown catch-and-run. The play was very similar to the game-changing touchdown Richards made in the 2016 Russell Athletic Bowl against West Virginia. Junior running back Mark Walton struggled to find holes against the stout Blue Devils’ run defense, rushing for just 51 yards on 17 carries. He did add 79 yards receiving on four catches, but it’s possible the injury he suffered against Toledo in week two might have been bothering him. He was shown limping after multiple plays throughout and left the game after seemingly re-injuring his ankle in the fourth quarter. The status of Walton’s ankle is not yet known, but he was able to walk off the field by his own power. Miami will travel to play Florida State at 3:30 p.m. on Saturday, Oct. 7, at Doak Campbell Stadium. – Berrios leads the Hurricanes in receiving yards on the year with 192 yards on 10 catches. He only had 178 receiving yards total in 2016. – With his touchdown catch against Duke, Berrios is now the first Miami receiver to have a touchdown catch in each of his first three games in a season since Andre Johnson in 2002. – Former Hurricanes Corn Elder and Brad Kaaya were seen with the team on the sidelines. Both players are currently members of the Carolina Panthers. – After hitting a 20-yard field goal in the second quarter, senior kicker Michael Badgley moves into a tie for second all-time in field goals made at Miami with 64. He ties former Cane Jon Peattie.